It seems that a special part of childhood has been lost in recent years. With the influence of technology and our hectic schedules, our children don’t have the same opportunity for extended periods of time outdoors – exploring and taking in the beauty of nature. It’s time to bring that magical time back, for kids and parents both, and there’s no better way than with this special family activity. Gardening is about more than just growing things. It shows us the rewards of hard work, allows us to get outdoors and away from distractions, and brings a sense of peace and connection. Sure, we all plant a couple flowers in the yard every year, or we grudgingly get out there and pull those pesky weeds. But what if we could use the experience of gardening to bond with our children and teach them a few special lessons? Gardening teaches kids patience, perseverance, and the beauty of life coming from such a small beginning. A seed sprouts into a large plant and bears fruit or flowers that feed us and other creatures of God. What could be a better symbol of our faith to share with our little ones? 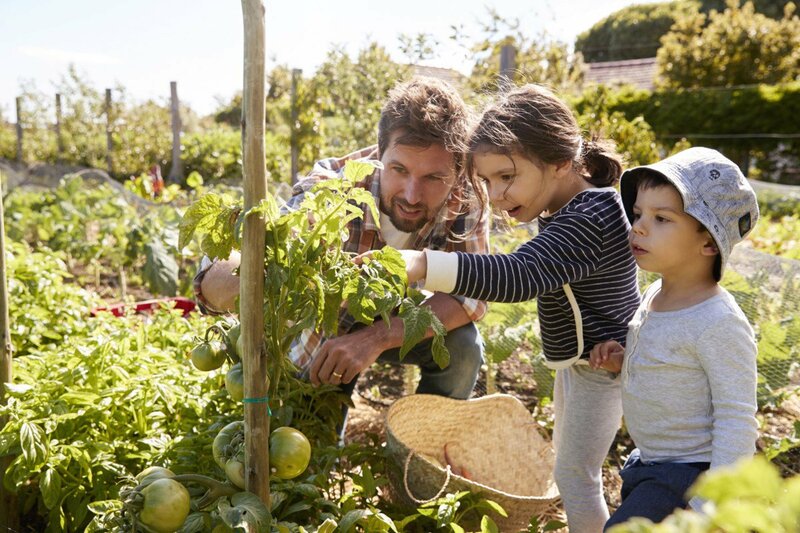 Creating a family garden is something that everyone can participate in. First, sit down and make a plan of what you’d like to grow. It can be a flower garden, vegetable garden, or a little bit of both, depending on where you live and the space you plan to use. You don’t need a huge space to cultivate a garden. A small patch in the backyard or even on one side of the house works just fine. Don’t have a yard? Container gardening is just as rewarding and many retailers sell raised-bed kits for small spaces like porches and patios. Grab your plan – it can be a drawing or list that the kids help you put together – and head to your local home improvement store. They can get you started on the basics – what you will need and how to care for your special patch of land – and they even sell child-sized gardening tools to make it more fun! Once you’ve started your garden, give each child a job to do. One can water the spot each day, one can watch for leaves, and one can keep an eye out for the first sprouts pushing through the soil. If you have the space, place a little bench or picnic table next to your garden space. Have a snack outside, read a book, or draw pictures together each day. Involve the kids in other activities to make the garden special while you’re waiting impatiently for the first signs of life. Make a birdhouse together, or if you’re not handy with carpentry, purchase an unfinished birdhouse from the craft store and paint it! Each child can make their own, and they even sell houses for butterflies and ladybugs. The kids can also paint their own flowerpots with weatherproof craft paint. Have them put their handprints on them with their name and date for a special keepsake. While you’re waiting for your garden to start growing, purchase a flower or plant that is already in bloom for their handmade flower pots. This way, they can have something concrete to take care of until those first few sprouts show up. There are also lots of kits available from home improvement and craft stores so the kids can make their own stepping stones for the garden. Have them leave an imprint of their hands or footprints, or let older kids make a mosaic with marbles or stones. And if you have some seeds left over from planting, draw an outline of a flower on paper and have the kids glue seeds in different patterns to make a mosaic. Even the smallest children can glue seeds to paper with supervision, and it helps develop their fine motor skills! As your garden begins to grow, read books or look at pictures online about the different stages of plant growth. There are many books available for kids that explain gardening, from basic picture books for toddlers to resource books for older kids. Older kids can take a small stem from each stage of your garden’s growing season and examine the parts of the plants. They can learn the names and functions of each part of the plant and even complex ideas like photosynthesis. How about even taking a look at them under a microscope if you have one in the home? This is a great science lesson, perfect for homeschoolers or anyone else interested in botany. You may even have them so interested that you’ll want to purchase a field guide to flowers and plants, or they may take up an interest in birds or insects with those little craft store houses you decorated! As you care for your garden throughout the season, you’ll find that you’ve made special memories together. Perhaps you’ve even started a tradition that the kids will want to carry on. Of course, when harvest time comes, celebrate! If you planted a flower garden, take pictures of the kids with the product of their labor. Better yet, take photos of the different stages of your garden with your kids posing in the picture! Cut some stems to put in a vase by their bed or to give to a family member or neighbor. Buy a flower pressing kit or make your own out of cardboard and waxed paper. You can’t beat the sense of pride the kids will feel. Did you plant a vegetable garden? Plan a special meal that the kids are involved in preparing with the harvest. They can even try their hand at creating their own recipe with their favorite vegetable from the garden. Invite the grandparents or friends for this special event, and don’t forget the pictures of the kids with the end result of their hard work – the great food you grew and cooked yourself! And if your garden isn’t as successful as you would have liked, you’ve still given the kids a special experience. It’s the process, not the product, that is worth all the time and effort. Gardening is one of those hobbies that can appeal to everyone. It gets the kids away from the television or tablet and into the outdoors for some fresh air. It relieves stress and is good exercise. It teaches valuable lessons like patience and seeing a project through from start to finish. And above all, it shows us all the miracle of God’s creation. We all begin as something so small, and we all grow into a unique and wonderful part of God’s plan. So get out there and get gardening! Do you garden with your children or have them help in the yard? Leave us your ideas for more gardening fun for kids!